Our mission is to help successful people create peace of mind, by delivering personalized wealth managment solutions. We work with our clients to ensure they have well thought out objectives, clear action steps, a realistic timetable to achieve their financial goals and protect the people and things they care about most. To engage our clients in courageous and passionate conversation, to understand their personal, professional and financial goals. To develop a deep level of trust, build lasting relationships with our clients, and always focus on serving their needs. To help our clients create peace of mind, by regularly monitoring their financial plan, and the progress towards their goals. To work with our clients to be good stewards of their wealth, and help them with multi-generational wealth planning. We have built a team of like minded individuals, who put client's needs first. We combine comprehensive planning, with quality risk management and investment products. 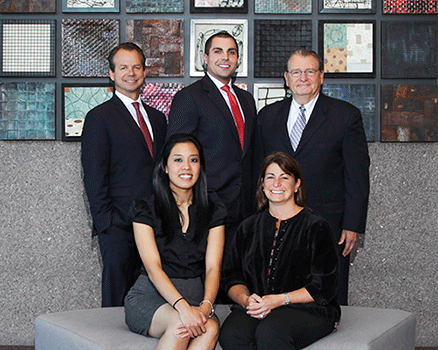 Our goal setting out has been to be the premier financial planning firm in Illinois. We have over 75 years of collective experience. We believe in being of service to the families we work with. We help them create peace of mind, by charting for them a course towards successful wealth accumulation and wealth preservation. We help to teach our clients about being great stewards of their wealth. This focus on risk management, wealth accumulation, and stewardship are the tools we use to help our clients make a financial impact for multiple generations.